Joe Bergen from Lock Haven PA is holding a nice lake trout he caught from Seneca Lake. This year Joe spent some time learning to jig for lakers.. The excessive weeds the the spiny fleas and the cost of gas have all made jigging a popular method to catch lake trout in the Finger Lakes. Joe caught this whopper on a 3/4oz white tube jig. He was jigging in one hundred feet of water when he caught this monster from the deep. The big laker was just over 31 inches long. Fishing for lake trout is a challenge. 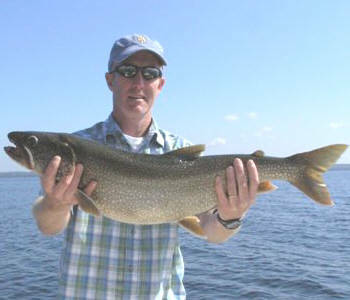 Most fisherman will target lake trout using down riggers fishing spoons in 70 to 150 feet of water. In the Adirondacks lakes that freeze over fisherman are able to ice fish the deeper water where these fish live and catch them using live bait and jigs. Another method that isn't so common anymore is known as pulling copper. This is a method where a fisherman in a small boat will use copper wire to drag a spoon or lure over the deepest water in the lake. It sounds odd but many a large laker has met his demise this way. Jigging for lakers is becoming a very popular method in the Finger Lakes Region. Fisherman are using jigging spoons and bass jigs to entice lakers. Some are using a fish attractant on the baits others may be tipping the jigs with live bait or chunks of cutbait. The new fish finders are able to track you jig down to the bottom in 100 feet or more and you can even see the fish chase or attack your jig. 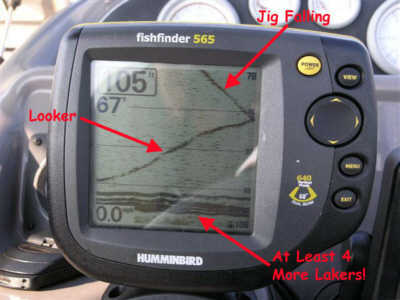 Fisherman are quick to adapt and incorporate new methods and technology that make our sport more fun and productive. Seneca Lake was formed by glaciers many years ago. It is just over 38 miles long and has a maximum depth of over 600 feet. It is the largest and deepest of the Finger Lakes. The lake has two main inlets. Catharine Creek and the Keuka Lake Outlet that provide most of the water entering the lake. The outlet for Seneca Lake is the Seneca River and is also known as "The Canal". The Seneca River joins Seneca and Cayuga lakes at their northern ends near the Montezuma Swap. The Seneca River also links to the N.Y. State Barge Canal system allowing boaters to travel across the state or from one lake to another. Seneca Lake is home to the following species of fish lake trout, brown trout, rainbow trout, landlocked salmon, largemouth bass, smallmouth bass, yellow perch, northern pike, chain pickerel, rock bass, crappie, sunfish, bullheads, bowfin, white suckers, channel catfish, lake sturgeon, carp, alewives and smelt. The state does an annual stocking of lake trout, brown trout and landlocked salmon. The lake's rainbow trout population is sustained entirely by natural reproduction in Catherine Creek and its tributaries. So catch and release of rainbow trout in Seneca Lake is greatly encouraged. Fishing Derbies on Seneca Lake include the National Lake Trout Derby which is held every Memorial Day weekend on Seneca Lake. New this year was the Red Cross Fishing Derby which was a big hit with fisherman. Many fishing clubs have their own contest for bass, trout and perch here as well.